State-licensed growers in Washington have already grown vast amounts of marijuana under blinding lights in non-descript warehouses and on fenced-off fields in Eastern Washington. But how those plants are cared for, who these growers are and how this industry shakes out is all in question. Our multi-media series entitled “First Cut: Washington’s Freshest Crop, and the Wild-[North]West Farmers Giving It A Grow” is a collaborative effort between the Northwest News Network's Anna King and The News Tribune’s Jordan Schrader. The series will examine Washington state’s newest high-value crop and the wild-west personalities it attracts. "First Cut" is a reference to the hay industry. "First cutting" means the first crop of hay of the year. It's often a very quality product that is sold for the highest prices of the entire season. Later hay goes for a lesser price. Haying, like pot grows, is a risky business. One rain, or the wrong bugs can wipe out a farmer for the season. From the Yakima Valley to the Columbia River to the Cascade Foothills, we will look at profit margins, security issues and some interesting collaborations. We will look at the pros and cons of growing outdoors versus indoors, pesticides versus organics and why not everyone growing this newly legal crop is going to be a winner. First Cut will also feature companion stories in The News Tribune, based in Tacoma, Washington. Safety First: Are Security Requirements For Legal Pot Grows Enough? Washington state’s new pot grow operations have state-required alarm systems, dozens of cameras and tall fences. But some growers said they aren’t worried about theft and violence. 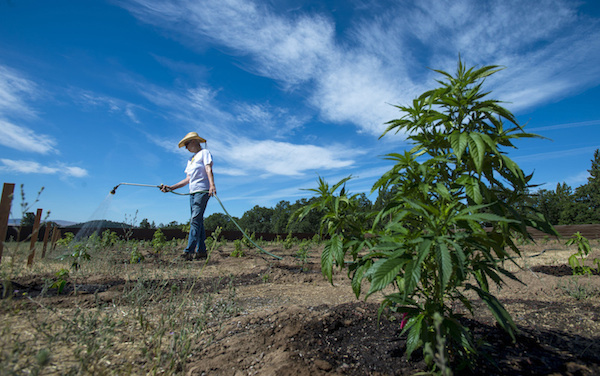 Odd Couple: Where Does A Straitlaced Farmer Get Pot Growing Expertise? In Eastern Washington, a pair of very different guys teamed up to embark on an experiment to grow Washington’s latest agricultural crop -- legal marijuana. Figuring out how to maximize yields on legal marijuana in Washington state will be tricky -- and not every licensed farmer will survive the competition and the tight margins. Dark 'n' Light: Is It Better To Grow Marijuana Indoors Or Out? As legal pot growing operations spring to life from urban King County to remote corners of Washington state, an ongoing debate has developed within this new farming community. This week, we’ll be examining Washington's freshest crop - marijuana. The agriculture, the security and the personalities.